BlogPaws 2013 came and went like a passing summer shower in Miami--all the thunderous preparations and anticipation (except there are no dark clouds), a downpour of bloggers and "pawties" (aka networking events), and then we cleared the Sheraton hotel like rays of sunshine, and headed back home to improve upon our efforts and continue educating and/or entertaining readers about all things pets. This was my second BlogPaws conference and I was even more excited to attend than the previous year for several reasons--Reuniting with friends, meeting other bloggers for the first time, making new connections with other bloggers and major pet vendors and organizations, and attending seminars eating meals with pets--dogs, cats, rabbits, ferrets and baby chicks. What started as a one-person effort to manage community cats and educate neighbors with a simple blog, Riverfront Cats has grown to a fully operational nonprofit with followers nationwide. 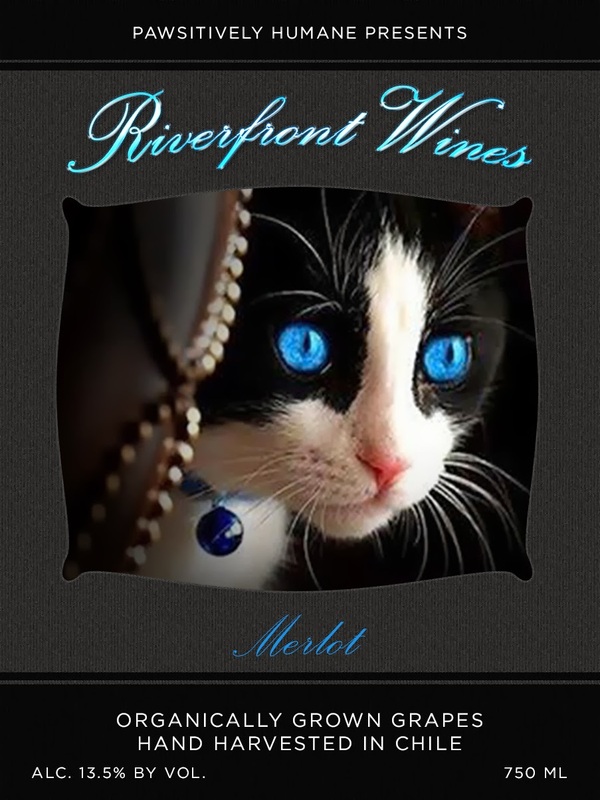 While we are still relatively small (four volunteers), the progress of Riverfront Cats would not be possible without harnessing the technology of the internet and social media. BlogPaws 2013 brings it all together --people and technology. In 2012, I had met other bloggers online and to meet them in person and have an actual conversation more than 100 characters long was sheer delight--squeals, big hugs and broken record refrains ad nauseam "Oh my gosh, I can't believe I finally get to meet you!!!" The blossoming of a new friendship is not only a benefit of the conference, it's a treasure. Pictured below are Terry Frum (Brian's Home) and Caren Gittleman (of Cat Chat and Dakota's Den) Terry and Caren are the two of the most genuine people, loyal blogging friends and passionate supporters of all cats, especially our Riverfront stray and feral Cats. I am over the moon to have finally met them. Check out their blogs! Teamwork or the collaboration of residents, neighbors, organizations, schools, and corporations can make a difference in improving the welfare of pets. We see it everyday as bloggers, small and large non-profit organizations and companies unite to educate the public about the benefits of adopting shelter pets, the latest science in pet health and nutrition, property training techniques...the list goes on. A personal highlight was meeting Olivia Melikhov, Social Media Manager from the ASPCA. 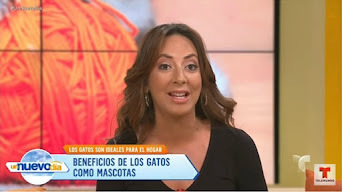 One of their goals is to work with small local nonprofits like Pawsitively Humane/Riverfront Cats for reversing the rate of homeless pets in Miami. Super exciting! Earlier last year, I developed new relationships online with famous cat bloggers thanks to a difficult situation (the Loews Hotel cat saga) that willingly came together for a common good. 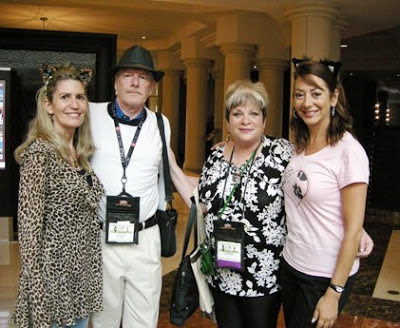 I met them at BlogPaws 2012 and throughout the year we have kept in contact via comments on blogs and Facebook. The mutual support is a blessing and I am most grateful. Reuniting at BlogPaws 2013, was a definite highlight. Our presence was visible and dog owners and hotel guests took notice. Note most cat bloggers were not wearing cat ears. Our bond of sisterhood, our creativity and our talent were evident, especially at the award ceremony. 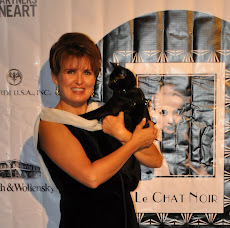 Pictured below is Deb Barnes, she is the author of The Chronicles of Zee & Zoey book and blog. Deb was nominated for a Nose-to-Nose award for best writer. She is a true professional, a talented writer with a genuine heart and I am honored that she has joined the board of directors of our nonprofit. Love these ladies--talented, down-to-earth and so much fun! 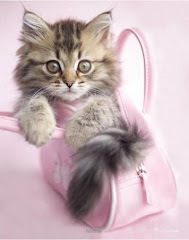 Tamar's witty and fabulous blog I Have Cat and Angie's humorous blog CatLadyLand are wildly popular. (Hey where's my tan? Yes we were under special lighting--I suppose so we glow). Another highlight was the award ceremony. 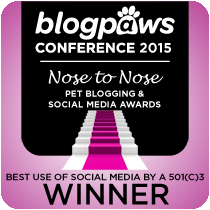 Many of my friends (cat bloggers) were nominated. I was tickled to sit at their table and cheer them on like a borderline rock star groupie. The modern cat writer is here and we're making a difference! Congratulations to all the nominees and winners of the Nose-to-Nose awards! 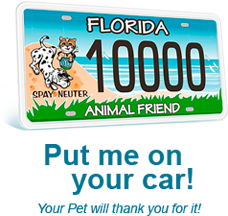 visit our big brother site, Pawsitively Humane, Inc. It's the camaraderie with pet owners, the sisterhood with cat bloggers, the inspiration from award-winning writers and social media mavens and the sight of so many cute pets that make BlogPaws paws and shoulders above any other conference. See you all at next year's conference in Vegas! Until three months ago you could say I was the typical person who said “I’m not a cat person”. 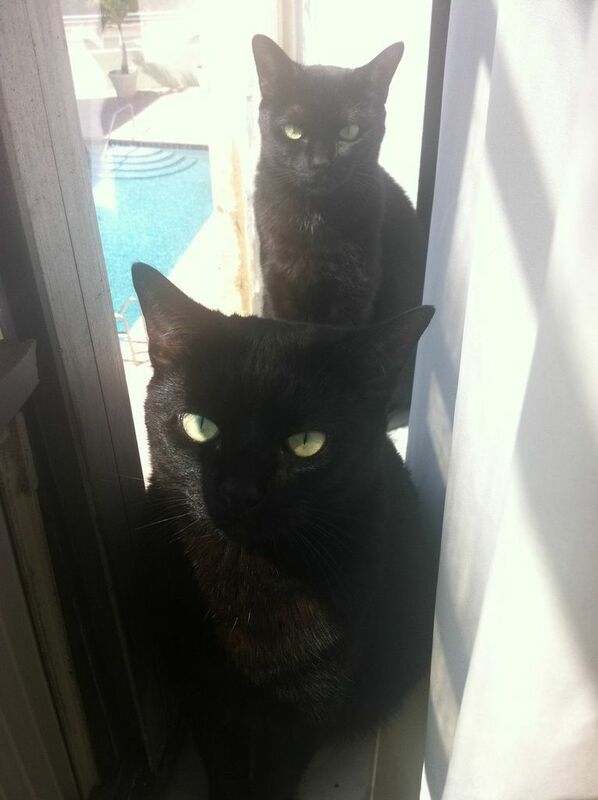 But that changed in the moment when my husband and I decided to foster Roxie and Sheena, two year old beautiful black cats. Their previous owner was an elderly man who died from natural causes. He had many cats and all of them were taken away after he died, except Roxie and Sheena. Nobody wanted them because they were black. "Really?" I thought. A close neighbor of the former owner started to take care of them while they were moving all the belongings from the previous owner. She couldn’t adopt them because the landlord did not permit pets. Then the moment came when the apartment furniture and belongings were removed and these beauties were going to be dropped off at the county shelter. That’s when Kerry (a friend of the neighbor who was taking care of them) contacted Christine (founder of Riverfront Cats) for help. Christine asked me about the possibility of fostering Roxie and Sheena for three months. I was doubtful at the beginning since I never had cats in my life, only dogs. However, after listening to their story and seeing pictures of the black beauties, I talked to my husband and we decided to take them in. We agreed only for three months. 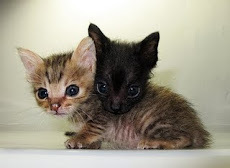 When they were brought to our home, Roxie and Sheena were very afraid and nervous. There weren't the only ones. I always said I didn’t like cats because they don’t play with you like dogs and they are not as affectionate as dogs. OH I COULDN’T BE MORE WRONG. Roxie and Sheena were living proof of how sweet and affectionate a cat can be when you take the initiative to demonstrate affection, love. They were sad because their owner died, the melancholy was evident in their body language so my husband and I gave them their space for a couple a weeks to recover. After that, we started petting them little by little and then playing with them. Roxie started to get very attached to my husband. She followed him around the apartment, rubbed against him all the time, more than me, and by now she sleeps on his side of the bed every night. On the other side, Sheena is attached to me, she wants me to pet her all the time, more than my husband, and sleeps on my side of the bed sometimes. We each have a personal fan. After seeing how their behavior changed and how much they love us, we decided we are not fostering anymore, we are adopting them; they are our little girls. There are no words to describe how happy we are to see them greet us at the door every day when we get home from work. 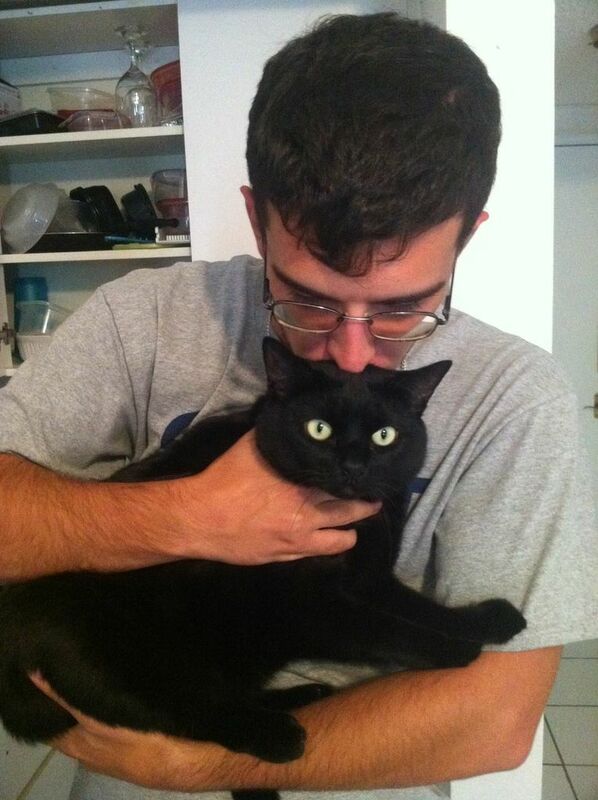 My perception of cats has forever changed, especially black cats. They are particularly smart and beautiful. Also, I can say our relationship as a couple has improved since bringing home these would-be orphaned black cats. Our bond is stronger. My husband and I enjoy quality time with our furry children. This experience has enlightened, prepared and validated our parenting skills for when we have human children one day. They both require attention, affection, routine and discipline for healthy growth and development and a happy home. In my personal opinion, adopting any pet in need, is the most rewarding experience you could ever had. Interested in adopting and providing a new home to a deserving pet? 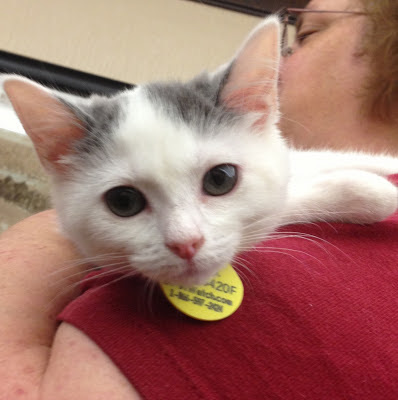 Maddie's® Pet Adoption Days, is hosting a big free adoption event. This is the biggest free pet adoption event in the Mayor's Alliance for NYC's Animals is leading the charge in New York City!. Mayor’s Alliance hopes to place hundreds of dogs and cats in qualified forever homes in the New York City Area on June 1 & 2. Free adoptions for qualified adopters will be offered throughout that weekend at participating shelters and other adoption locations, and at two large, outdoor adoption events in Manhattan. To see other cities participating in Maddie's® Pet Adoption Days click here. 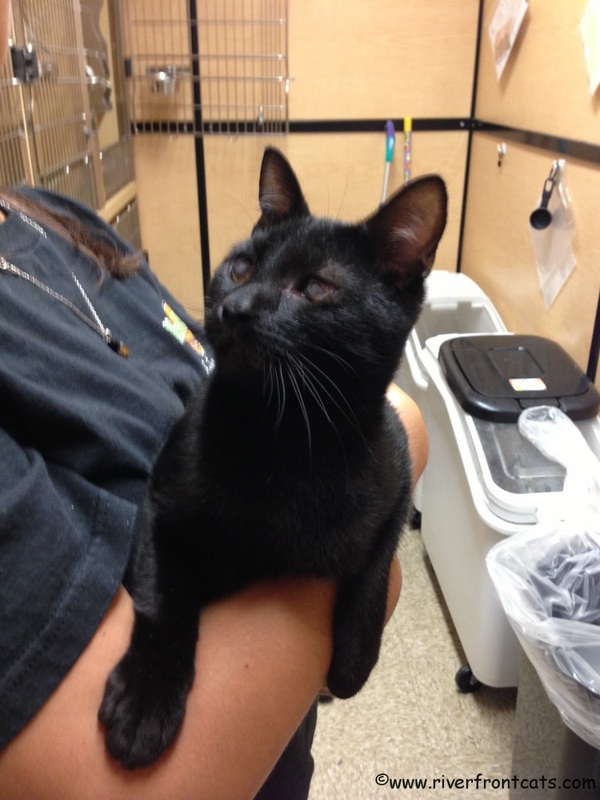 Fritz is a beautiful and loving eight- month old cat who lost 10% of his vision due to an eye infection caused by some monsters who poisoned him with antifreeze at the trailer park he used to live. He was rescued along with her sister Fran by Cassandra Catraya. Fritz had to go through an arduous protocol of medicated drops to recover from this horrible poisoning, but this brave angel was more than cooperative through the whole process. And maybe you think that after all he has been through he would be scared of people and other cats. Well, that's not the case! In the adoption center where was living, he can be seen playing with other cats and being affectionate with everyone who holds him. This story with a difficult beginning deserves a happy ending. Fritz deserves the opportunity to be part of a loving home where he can be the normal cat that he is and receive all the care and affection he deserves. He has a lot to give and eight lives to live. Despite his glossy blue eyes, he really can see well! 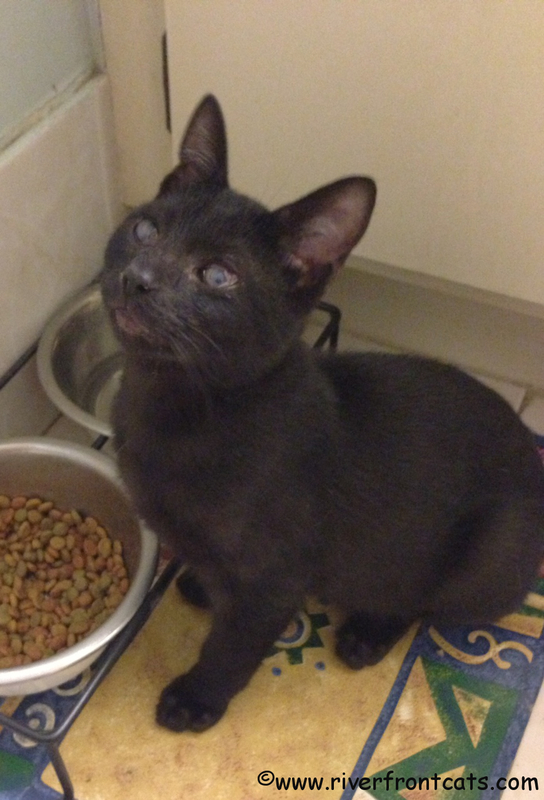 Anyone interested in adopting Fritz and providing a permanent home can email Cassandra Catraya at cassiwc@live.com. Thank you for sharing this post. Thank you for caring. ... for one of our Riverfront Cats. Lion King crossed the rainbow bridge. This day came too soon. 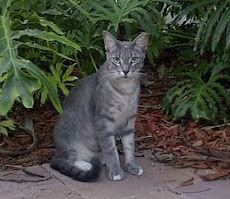 Lion King was an outdoor community cat near the Miami River in downtown Miami cared for by a small team of volunteers. He was visibly losing weight drastically. Volunteers observed that he flinched in pain at the first bite of food, even moist food. He was starving. After much effort, volunteers finally caught him and rushed him to the vet. Lion King was treated for gum infection and had two teeth extracted and was released outside days later. But the FIV won the war. 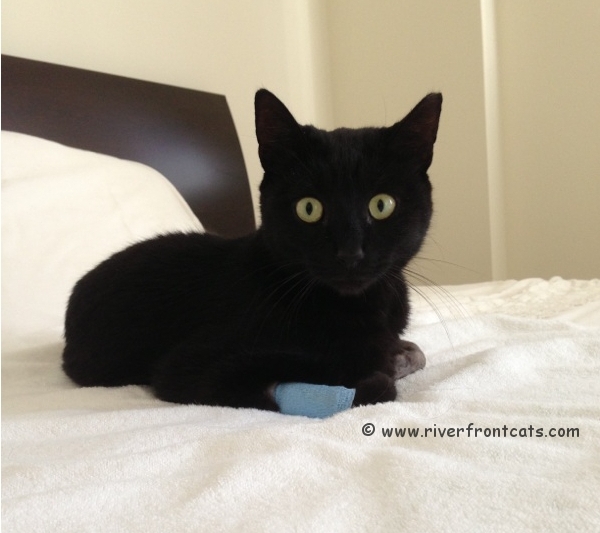 His FIV (Feline AIDS) was advanced and this prevented him from fighting the infection. Living outdoors would expedite his dying days. He was withering away. Lion King would die of starvation--a slow painful death. That's when we knew the time had come. 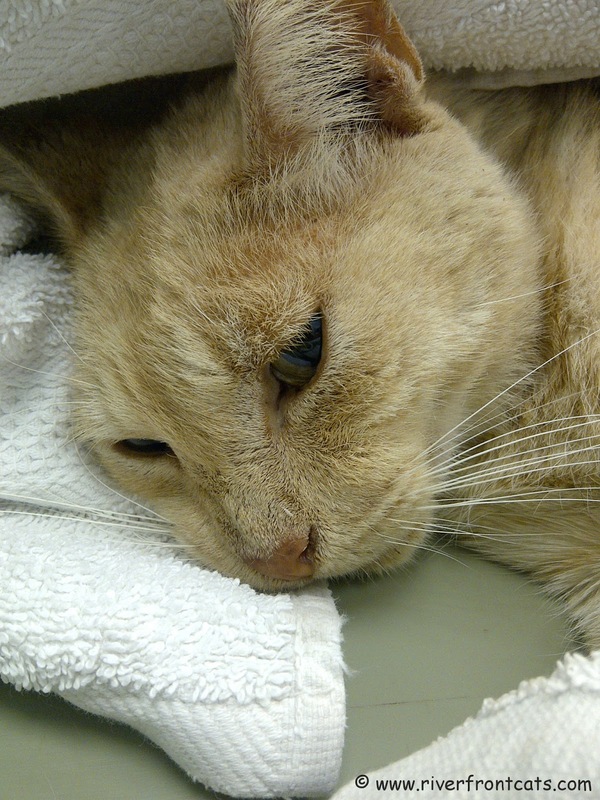 At the vet's office, I cradled Lion King in a swath of white towels. He looked like an angel, his lackluster gold fur and big round green eyes locked with mine. He didn't flinch, no hissing, no writhing. He looked at me with ease. He trusted me. The tears rushed down my face. The pain and grief crushing my spirit. Dr. Wilber reassured me, "he knew to trust you.". Little did she know the irony. The dagger piercing my heart. Lion King was the very first cat and first feral cat I ever trapped in learning about TNR and TNRM in 2009. He was also the first Riverfront Cat I had to put to sleep. He was feral in every sense. I recalled the first week I saw him, roaming around the construction trailers on the neighboring empty lot and how he stayed at a distance with a scowl, and would not eat his bowl of food until I was a measurable distance away. In my mind, I called him "Mr. Meanie" but never dared to mouth those words for fear of it coming true. Over the years, he inched closer to volunteers, waiting for the dispensing of food. In another year, a shocking advancement. Lion King, a feral cat, gave nose kisses to my dog Ma Cherie (a Maltese). I couldn't believe my eyes. You see Ma Cherie was accustomed to cats, scared and docile cats. She knew to wait for them to approach her. Clearly Lion King appreciated a four-legged animal that didn't pounce, hiss, attack or scratch. Then in 2012, one day while talking to another volunteer outdoors, Lion King appeared and started rubbing against our legs! These were the baby steps that every parent gushes over and wishes they had a photo or video camera to record the moment. Would he repeat the gesture? Yes. Then eventually he allowed us to pet him on the top of his head and down his back. 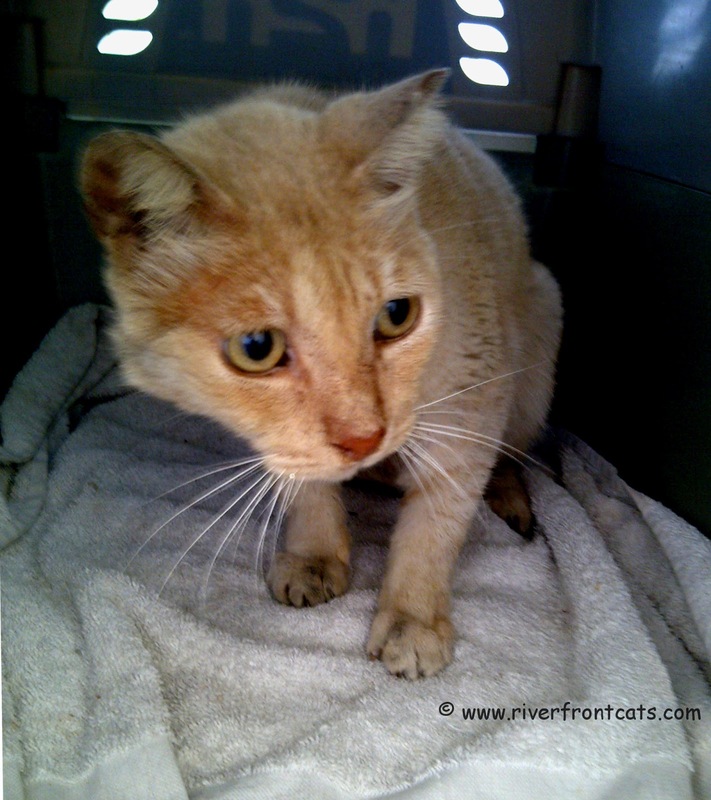 Here are photos last October for National Feral Cat Day! 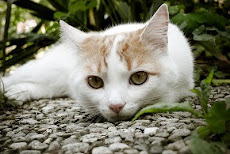 Community cats become outdoor pets. Each with their unique habits and personality. You can't help but love each and every one. No matter if they hiss, no matter if they do not let us touch or pet them, volunteers read cat body language. When a community cat starts kneading or rubbing their chin against a tree trunk or solid object, we call this the "happy dance". They are happy to see you. Even the feral cats. Through this daily interaction, walking the neighborhood, feeding cats, talking to them, petting them when permitted, checking for new ones, the average person is amazed at their range of emotions and ability to communicate. In the past two months, Lion King transformed to a sweet cat, kneading, purring and for the first time, meowing. He was like an orphaned child, hungry for affection and food. Sitting in the waiting room of the vet clinic, Lion King in his carrier started purring. Ok so it could be a nervous purr. But then he started kneading. He was comforted by my stroking his gold fur. This once feral cat was literally melting in my hands! I cried quietly. "Why now?" I asked God. "Why now after four years does he trust me unconditionally?" 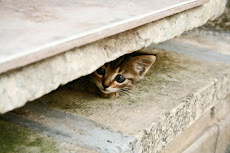 But as a feral cat caretaker I knew the answer-- The dangers of living in a city. On average they live to six years of age. Lion King was anywhere from 4-5 years old. And in those years, he lived a good life. He was fed daily, never missing a meal in four years, 365 days. Ours was a a journey built on trust--just like any relationship. It took time and patience and routine. Nothing is impossible with patience and regular TLC. Lion King sought shelter from severe rains in our condo garage and appeared for feedings outside at a designated area volunteers created and named "Station 1". He was indeed a King, staking the west side of the Riverfront, protecting the other cats from invaders and patiently waiting for us humans nightly to provide sustenance. Dr. Wilber asked me if I wanted to stay for the final injection. "Oh no," I stated emphatically. I said my goodbyes while he lie awake on the clinic bed, his head on the pillow, his shriveled body tucked underneath towels like blankets. I stroked his head "Lion King, I have to say goodbye. You taught me so much about cats and about myself. You changed my life for the better. Now you're going to a better place. No more suffering Lion King. You're going to pet heaven. And I promise Lion King, I will see you there in the future. I don't want to go to people heaven. I asked God to send me to pet heaven. No more suffering my sweet boy. No more suffering. Run, play and eat all you want. I love you." As I looked up at the vet, she too was crying. She thanked and comforted me with kind words "Lion King had a good life thanks to you. Without you he would die a slow painful death. He knew to trust you." Absorbing her words, the tears paused. Yes, Lion King had a wonderful life as a cat, free to roam the outdoors--climb trees, hunt for insects, play with his friends, and breathe fresh air. I made a difference. Lion King was the first male homeless cat that I came across upon moving to these newly built condos. I had already encountered Aurora, Pandora, Midora and Cosette, all females. So I anointed him "Lion King" his gold fur fit for royalty. Despite the fact that he was feral, and a gruff exterior to match, I knew he would make a good king. Little did I know he would teach me, not just the Circle of Life but also "The Circle of Love". Cats form a bond with their environment and people. They don't just receive food, they give back like any pet. 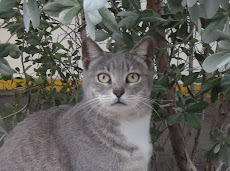 In feeding these cats daily, spending a few minutes with them, they enriched my life.They teach me respect for nature, never take anything for granted, and most important -- humility. Until we meet again Lion King, we will continue the circle of love. on behalf of Sabrina, Mollie, Richard, Larry & Juan. Christine feeds Leroy and Lion King. They were best friends. Lion King was the leader of Station 1. He watched over and protected the other cats including Nikki, Sonny, Tiffany and Leroy. Lion King adored Leroy and they often could be seen playing together. Lion King became visibly sad when we had to take Leroy away due to severe injury. This was the first time we ever heard Lion King meow, he was crying. Leroy had leg amputation and is recovering nicely. He will become an indoor pet cat. At this time we are still collecting donations to pay the vet bill. Any amount is greatly appreciated. Feel free to donate by clicking the DONATE button.Thank you for continuing the circle of love. Mother's Day is soon approaching--May 12. Don't procrastinate and wait until the last minute. Shop at Amazon now and a small proceed goes to Riverfront Cats*. In a hurry? Indecisive? Not sure what your mother or mother-in-law will like? Purchase a gift card! For a personal stylish gift, click below for ideas! Below are some ideas from jewelry to electronics and books and more! 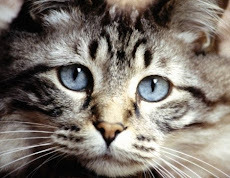 PLEASE CLICK ON OUR AMAZON BANNER AD to the right to begin your shopping experience so that Riverfront Cats receives the credit. Or click on these photos and it will connect you directly to the Amazon page. A heart pendant is a classic gift any mother will appreciate. Sterling Silver "A Mother Holds Her Child's Hand For A Short While And Their Hearts Forever" Open Heart Pendant Necklace with Diamonds (0.1 cttw, I-J Color, I2-I3 Clarity), 18"
Price: $77 + Free Shipping. Sterling Silver "A Mother Holds Her Childs Hand For A Short While and Their Hearts Forever" Open Heart Pendant Necklace, 18"
*Riverfront Cats is an associate of Amazon and receives commissions for your purchases through links on this blog. Amazon does not endorse any of its associates. 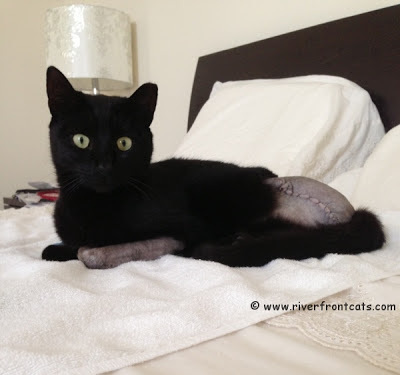 "That camera looks more scary than my shaved hip with stitches"
We have an update on Leroy! As we shared on April 29, the good news is that the front leg was healing and could be saved. The bad news, the fever returned and the hind leg was deteriorating. Apart from this setback, Leroy's overall health was very good. So we agreed to amputate the back leg and start making plans to find him a permanent home indoors where he could live a long, safe and happy life as a tripod. At the vet: "This can't be good." "It's not as bad as it looks. I can still move around. Now I hop!" Thankfully, the surgery went well, no complications. 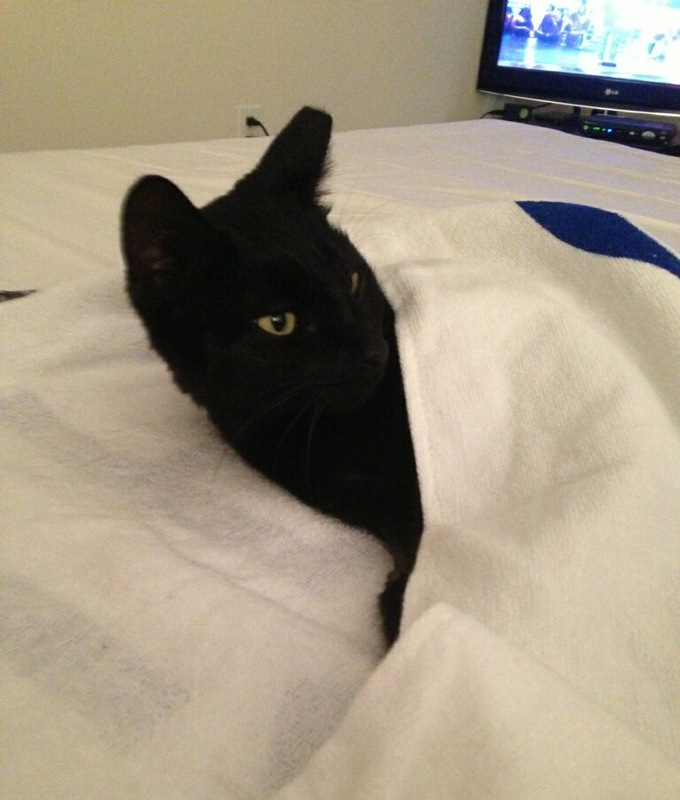 Leroy is now recovering in the home of a volunteer. He sleeps with Sabrina every night on her bed. A sweet black furry angel. In the day time he nestles in a pet bed and hops a few steps away to the litter box. Losing a leg and adapting to the indoors will take some time. In the meantime Leroy is getting much needed rest, daily pain medications, and lots of TLC. Thank you Sabrina! Naturally as a nonprofit that depends on donations, we have to share that the vet bill was $1,938.39. Please click here to review the entire bill. This is in addition to the $600 originally spent to try and save his legs. Was this the right decision? YES! To know this cat, everyone loves him. He wanted to live, and we know he has much love to give. If both legs could not be saved, then the outcome may have been different. Now we are moving forward. If you can help with any amount,whether it's $1000, $100, $60, $40 or even $10, it is greatly appreciated! Just click on the link at top right. You can easily donate with credit, debit or bank funds. We also accepts checks. 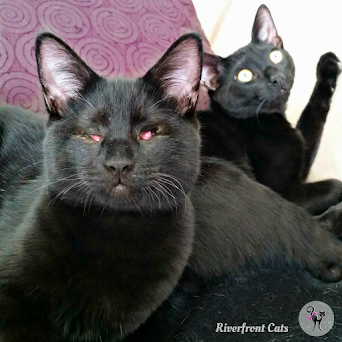 Riverfront Cats is part of Pawsitively Humane,Inc. a 501c3 organization. This is the second amputation of a cat in six months. The vet bills avalanche before we have a chance to recover from the last emergency. Our volunteers receive zero compensation. The funding goes primarily to the care of the cats. We are grateful for any amount! Soon we will begin the work of finding him a loving home. Preferably with an individual or family that spends more time at home than outside the home until Leroy is comfortable in his new environment and the routine. 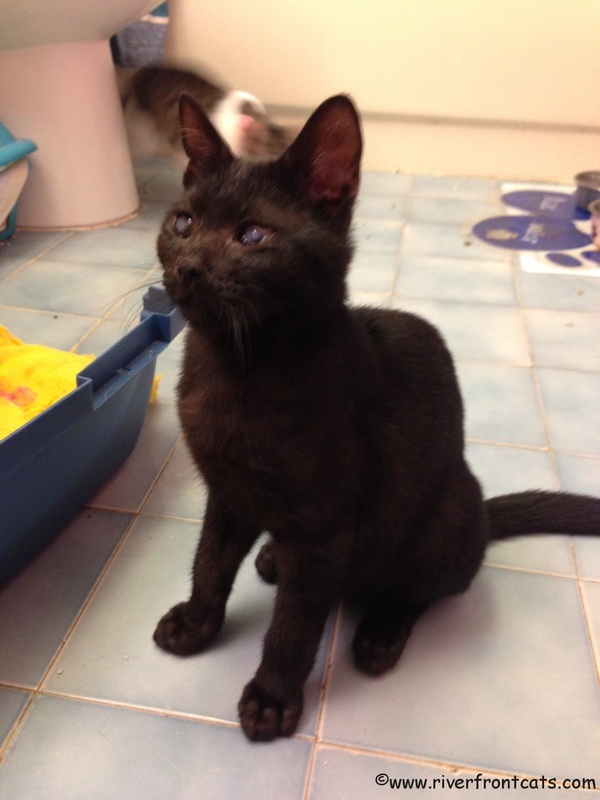 Leroy has demonstrated that he gets along with other cats and well behaved dogs. Leroy often rubbed against Christine's dog, Ma Cherie, and gave nose kisses. 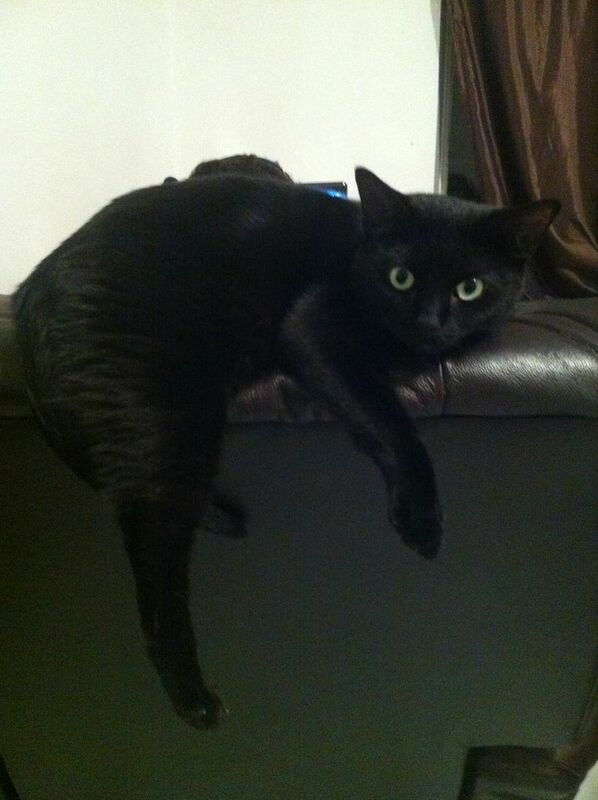 Cats are amazing, but Black cats are even more special!